Not to be confused with laser sight. View through Tasco ProPoint red dot sight (model PDP2ST) on a Ruger 10/22. Made in Japan for Tasco, the ProPoint 2 was one of the first red dot sight models to become widely popular. A red dot sight is a common classification for a type of non-magnifying reflector (or reflex) sight for firearms, and other devices that require aiming, that gives the user an aimpoint in the form of an illuminated red dot. A standard design uses a red light-emitting diode (LED) at the focus of collimating optics which generates a dot style illuminated reticle that stays in alignment with the weapon the sight is attached to regardless of eye position (nearly parallax free). They are considered to be fast acquisition and easy to use gun sights for target shooting, hunting, and in police and military applications. Aside from firearm applications, they are also used on cameras and telescopes. On cameras they are used to photograph flying aircraft, birds in flight, and other distant, quickly moving subjects. Telescopes have a narrow field of view and therefore are often equipped with a secondary "finder scope" such as a red dot sight. Diagram of a typical "red dot" sight using a collimating mirror with a light-emitting diode at its focus that creates a virtual "dot" image at infinity. 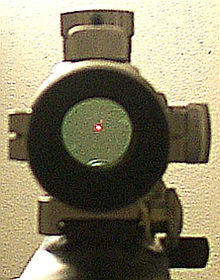 The typical configuration for a red dot sight is a tilted spherical mirror reflector with a red light-emitting diode (LED) at its off axis focus. The mirror has a partially silvered multilayer dielectric dichroic coating designed to reflect just the red spectrum allowing it to pass through most other light. The LED used is usually deep red 670 nanometre wavelength since they are very bright, are high contrast against a green scene, and work well with a dichroic coating since they are near one end of the visible spectrum. The size of the dot generated by the LED is controlled by an aperture hole in front of it made from metal or coated glass. The LED as a reticle is an innovation that greatly improves the reliability and general usefulness of the sight. There is no need for other optical elements to focus light behind a reticle. And the LED itself is solid state and consumes very little power, allowing battery powered sights to run for hundreds and even tens of thousands of hours. Using a "dot" shaped reticle also greatly simplifies the sight since the small diameter image does not require a sophisticated optical reflector to focus it. More complex reticle patterns such as crosshairs or concentric circles can be used but need more complex aberration free optics. Like other reflector sights, the collimated image of the red dot is truly parallax free only at infinity, with an error circle equal to the diameter of the collimating optics for any target at a finite distance. This is compensated for by keeping the dot in the middle of the optical window (sighting down the sight's optical axis). Some manufacturers modify the focus of the LED/optical collimator combination, making models with the optical collimator set to focus the dot at a finite distance. These have a maximum amount of parallax due to eye movement, equal to the size of the optical window, at close range, diminishing to a minimal amount at the set distance (somewhere around a desired target range of 25–50 yards). Sights may also use a more sophisticated optical system that compensates for off axis spherical aberration, an error that can cause the dot position to diverge off the sight's optical axis with change in eye position. The optics used is a type of mangin mirror system, consisting of a meniscus lens corrector element combined with the semi-reflective mirror, sometimes referred to in advertising as a "two lens" or "double lens" system. Although these are referred to as "parallax free" sights, the system keeps the aiming dot in alignment only with the sight itself and does not compensate the inherent parallax errors induced by a collimated sight. Red dot sights generally fall into two categories, "tube" or "open" designs. "Tube sights" look similar to a standard telescopic sight, with a cylindrical tube containing the optics. Tube sights offer the option of fitted dust covers and the ability to add filters, such as polarizing or haze filters, and glare reducing sunshades. Since a reflector sight really needs only a single optical surface, the "reflector", the tube is not needed. This allows for non-tubed "open sights" that consist of a flat base, with a single loop of material to support the reflective optics. Most red dot sights have either active or passive adjustments for the dot brightness, allowing a very bright dot for high visibility in bright conditions, and a very dim dot to prevent loss of night vision in low light conditions. The idea of attaching a reflector (or reflex) sight to a firearm has been around since the sight's invention in 1900. Many different types of reflector sights specifically designed for firearms have been marketed, some lit by batteries and some lit by ambient light. The Weaver Qwik-Point presented the viewer with a red aiming dot generated by a red plastic "light pipe" used to collect ambient light. All had the reticle illumination drawback common with reflector sights small enough for a firearm: proper ambient lighting could not be depended on and incandescent light bulbs could drain a battery in a few hours. In 1975, the Swedish optics company Aimpoint AB marketed the first "electronic" red dot sight combining a reflecting curved mirror and a light-emitting diode, based on a design by Helsingborg engineer John Arne Ingemund Ekstrand. The sight was called the "Aimpoint Electronic" and had a closed tube design that could be mounted similar to a telescopic sight. The LED could run for 1500 to 3000 hours on mercury batteries. Other manufacturers soon followed with over a dozen offering models today. Newer generation red dot sights were produced with lower power consumption LEDs and power saving electronics, allowing them to run for years without being turned off. In 2000, the U.S. military introduced a red dot sight into field use, the Aimpoint CompM2, designated the "M68 Close Combat Optic". Red dot sight reticle sizes are measured in milliradians (mrad or mil) and minutes of angle (moa), which both are angular measurements, making them handy units to use in ballistics. Mils are handy when using SI units for range and subtensions, and can be calculated by measuring the group size in millimeters (or in centimeters and multiplying by a factor of 10) and dividing by the range measured in meters. Minutes is another convenient measure for shooters using English units, since 1 moa approximately subtends 1.0472 inches at a distance of 100 yards (91.44 m), which is generally rounded to 1 inch at 100 yards. While moa sights have traditionally been popular in the U.S., scope sights with mil adjustments and reticles are now also becoming increasingly popular in the U.S. The most common reticles used today in red dot sights both for handguns and rifles are small dots covering between 0.6 to 1.6 mil (2 to 5 moa ). The choice of red dot reticle size depends on the user needs. A larger and brighter red dot makes for faster target acquisition, but may obscure the target and thereby inhibit precise aiming, while a smaller and dim dot allows for more precise but slower aiming. The 1.6 mil (5 moa) dot is small enough not to obscure most handgun targets, and large enough for most competition shooters to quickly acquire a proper sight picture. Red dots for rifles typically have a smaller dot, often 0.6 to 0.8 mil (2 to 3 moa). When red dot sights started to appear at the practical shooting competition circuit in the 1990s, reticle sizes of up to 3, 4.5 or even 6 mil (10, 15 or 20 moa) were common in order to compensate for the lack of bright illumination. However, as red dot technology and production quality has advanced, the market trend in all types of sport shooting has gone towards the smaller dots used today. A U.S. Marine looking through an ITL MARS combination red dot and laser sight mounted on his M16A4 MWS rifle during the Second Battle of Fallujah in 2004. Miniature red dot sights are becoming increasingly popular for use on pistols, both for competition and military applications. House, James E.; Kathleen A. House (2006). "Red Dot Sights". Customize the Ruger 10/22: Comprehensive Do-It-Yourself Guide to Upgrading America's Favorite .22. Iola, Wis.: Gun Digest Books. pp. 239–241. ISBN 9780896893238. LCCN 2005935191. OCLC 767501402. Hawks, Chuck. "Telescopic and Red Dot Sights". chuckhawks.com. "The Beginner's Guide to Pistol Reddots". TRex-Arms.com. ^ House, James E. (2005). The Gun Digest Book of .22 Rimfire: Rifles·Pistols·Ammunition. Google Books. Gun Digest Books. p. 64. ^ "Gunsight - US Patent 5901452 Description"
^ "How Aimpoints, EOTechs, And Other Parallax-Free Optics Work". Ar15.com. ^ Dreyer, John. "Facts and Figures About Dot Sights". Encyclopedia of Bullseye Pistol. Bullseyepistol.com. ^ Butler, John B. "The Reflector Sight". American Rifleman. National Rifle Association. 93: 31. ^ Royal Dublin Society (1902). The Scientific Transactions of the Royal Dublin Society. Google Books. Dublin, Ireland. This page was last edited on 7 November 2018, at 19:57 (UTC).